In DC Comics continuity, there is currently a pretty big multiverse. In it, the main earth is Prime Earth. There are a lot of them, like Earth-23 with a black Superman as the president of the United States and the very spooky Earth-13 with Superdemon as its protector. This seems like very prime-earth-centric terminology. Do other continuities’ inhabitants view their worlds as Earth-0 and as the main world, as far as we know based on comics? The only moment I can bring to mind is not strictly DC canon. (But then, after never-ending reboots, what is canon?) 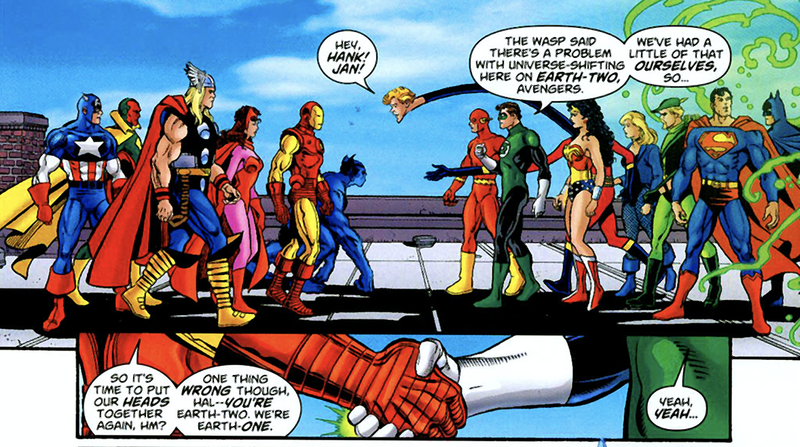 The image below is from the epic "Avengers/JLA" crossover event and neither side looks to be conceding to the label of "Earth-Two". Not the answer you're looking for? Browse other questions tagged dc comics the-new-52 dc-rebirth . Is the Flashpoint universe part of the 52 Earths? Does Barry Allen remember his life in the prime DC Universe? How was the Spectre put to Sleep and Woken during Crisis on Infinite Earths? What Earth is the Flash from? Can Superman prime in a battle lose against the Flash? Are the Earths in Injustice 1 and 2 ever named?